The black box recovered from the wreckage of the plane crash that killed Brazilian presidential candidate Eduardo Campos did not record his flight, Brazilian Air Force (FAB) says. It said the audio recording FAB experts had analysed was not related to the flight that crashed on Wednesday. A spokesman said they were trying to determine what the recording was. 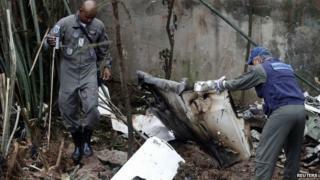 Mr Campos and six others died when his private jet crashed in bad weather in the port city of Santos near Sao Paulo. Experts from the Centre of Investigation and Prevention of Aeronautical Accidents in the Brazilian capital, Brasilia, have been trying to reconstruct the audio files from the black box in search for more clues as to what happened in the lead up to the accident. "The two hours of audio, the maximum recording capacity of the equipment, which were received and validated by certified technicians, were not of the flight of 13 August," air force spokesman Pedro Luis Farcic said in a statement (in Portuguese). "It is not yet possible to determine the date of the dialogue recorded in the CVR (Cockpit Voice Recorder), given that this equipment does not record this information," he continued, adding that an investigation would determine what may have happened. Shortly after the accident, President Dilma Rousseff declared three days of mourning and halted all her re-election campaign activities for October's presidential poll. Mr Campos, of the Brazilian Socialist Party (PSB), had been running third in opinion polls. It is not yet clear who will replace him as presidential candidate for the PSB. The party has said it will meet on 20 August. Analysts say his running mate, 56-year-old Marina Silva, a popular politician and a former environment minister, could step in. Under Brazilian law, the party has 10 days to choose a substitute. It could also decide not to run and throw its support behind another candidate. The 49-year-old former governor of the north-eastern state of Pernambuco was on his way from Rio de Janeiro to the city of Guaruja, near Santos, when the Cessna 560XL he was travelling in went down into a residential area, killing everyone on board. Officials have blamed the crash on bad weather, but a federal investigation on the cause remains underway.